Organically grown Keemun from the Anhui Province. The dry leaf is black and golden. The color of this tea is one of my favorites in our selection- like a “red peach” but with a darker amber hue. The aroma is great, but the flavor is the key to this tea. Medium to full, with caramel and honey notes,and a long finish. Enjoy this tea- a new discovery for us. This is an exquisite black tea from Drink the Leaf. Such a pleasing complexity! And the flavor of this tea is remarkable! And with that said, I must confess that I find it difficult to describe it. There is a deep sweetness to it. Like the description from Drink the Leaf suggests, there are notes of honey and caramel to this tea – so the sweetness is there but it isn’t cloying. There is also a savory taste in the background that lingers in the background that tastes somewhat bitter – but again, bitter doesn’t describe it adequately. It isn’t an off-putting bitter, it is more like the bitter taste from a grapefruit, but without the tangy citrus-y note. This tea is very wine-like in character, with a glistening taste that is currant-like. Sweet, tannic, and delicious. I enjoy this tea hot or iced, but to enjoy the many complexities of this tea, you should try it hot. It doesn’t need sweetener – it is absolutely perfect as it is! A deliciously intriguing cuppa, one that you will want to enjoy often! We are excited about this new selection. Gyokuro means “Jewel Dew”. The dried leaf is almost aqua-green in color, extremely bright and inviting. After infusion, the liqueur reveals a bright Chartreuse color. The aroma is intriguing; with a hint of citrus and fresh cut grass, and a mild flowery note. On the palate it’s smooth with a natural sweetness. Flavors of toasted hazelnut or Nori seaweed comes to mind. Try this tea, and treat yourself to a jewel. 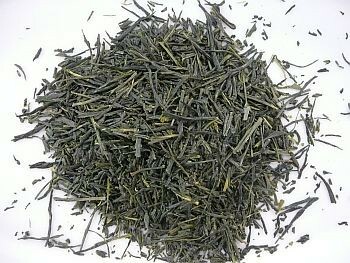 I really like Gyokuro… for two reasons. First there’s the flavor: It’s rich and delicious. Second, it’s incredibly easy to brew! This Gyokuro from Drink the Leaf is deliciously nutty and sweet. The above description suggests a hint of citrus in the aroma, and that citrus-y note translates into the flavor a little too. This does have a very pleasant vegetative quality to it – it doesn’t taste like fresh cut grass (or, at least, what I’d imagine fresh cut grass to taste like) – it has more of a steamed vegetable kind of flavor… possibly spinach? Yes, spinach with a squeeze of lemon and a tiny bit of butter. The buttery note is quite delicate: smooth creamy, sweet, and adds a very pleasing dimension of flavor to the cup. I am not one who eats seaweed (I don’t even like Sushi), so I can’t tell you if the Nori seaweed comparison in the above description is spot-on, but I can taste a little of the toasted hazelnut. In addition to the flavor of Gyokuro, there is the ease in brewing – it takes just 45 seconds in 145° F water to brew a cup of of this “jewel dew.” I use my Gaiwan to brew it… but be sure to use a strainer in addition to the lid when pouring the Gyokuro from the Gaiwan to the cup. The leaves are quite tiny, even after brewing, and can often sift through the lid. And while Gyokuro may seem a little pricier than other green teas on the market, the leaves can be infused many times – adding value to the investment. And once you’ve tasted Gyokuro, you’ll know that it’s worth the price! This tea is simplicity at its very finest! The color is a GREAT color of brown with reddish-peachy tones. It smells VERY tasty much like a bready-toasty type black tea scent. As for the taste of this tea…the taste is great! I can relate to the caramel and honey notes DRINK THE LEAF spoke of in the Product Description! I also appreciate the bready/cakey type chewiness it seems to have! It’s not sweet – but it’s not bitter either. The taste seems to linger and makes you crave more! Hong Tao Mao Feng from Drink The Leaf seems a little more complex that it gives itself credit for! I guess one could say it’s being modest…but it really shouldn’t be. This is a great tea!